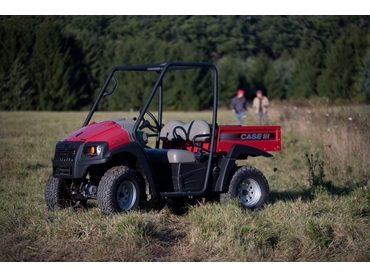 Case IH introduces their range of Scout Utility Vehicles, such as the two-passenger Case IH Scout with MacPherson Strut front suspension, independent rear suspension and a wide ratio CVT transmission for fuel efficiency and smooth shifting. Case IH’s range of Scout Utility Vehicles offer farmers the go-anywhere ruggedness in a quad bike with the safety and storage capacity of a utility vehicle. “The Scout range of utility vehicles offers capacity and versatility that ATVs can only dream of, with infinite potential for large and small properties alike,” says Case IH Marketing Manager, Kerry McCauley. The Case IH Scout Utility Vehicle Range also features hydraulic, four-wheel disc brakes, ROPS protection, retractable safety belts and Halogen headlamps.